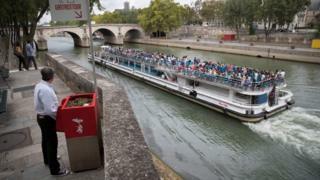 A boat cruise along the River Seine is one of most popular ways to see Paris, but angry locals are worried that a new installation may spoil the experience. “There’s no need to put something so immodest and ugly in such an historic spot,” Paola Pellizzari, who owns a nearby art dealership, told Reuters news agency. “It’s beside the most beautiful townhouse… the Hotel de Lauzun,” she said, adding that she was worried the urinal “incites exhibitionism”. But the local mayor, Ariel Weil, says the urinals are needed. Some argue that the “uritrottoir” – a combination of the French words for urinal and pavement – is discriminatory. “Uritrottoirs for men, great. But what about us women? Litter trays? Sexist ideas are not nice,” one Twitter user said [in French]. “They have been installed on a sexist proposition: men cannot control themselves and so all of society has to adapt,” feminist Gwendoline Coipeault told Reuters. “No one needs to urinate in the street,” she added.